Six power cords connected to the rear of the server provide power to the 12 power supplies in the server. Each power cord supplies power to two power supplies. 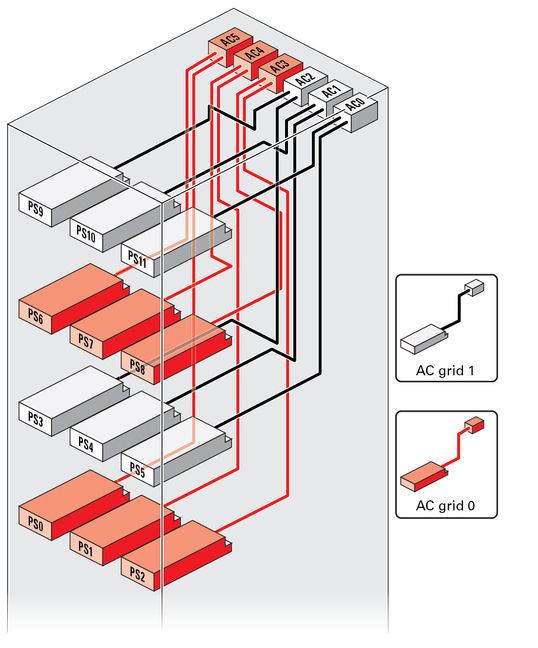 To ensure the redundant operation of the power supplies, connect the left three power cords to one AC power grid, and the right three power cords to another AC power grid (see Facility Power Requirements for more information). All 12 power supplies provide 1+1 (2N) redundancy in case of a power failure to a single AC power grid. The server uses 48A at 208V, 24A at 400V, and 20A at 480V of power from each AC power cord. When both AC power grid sources are connected through six power cords, each power grid runs at half the rated current per power cord. The power cord-to-power supply connections are as follows.